It hit a surreal 78 degrees (25.5 C) here almost two weeks ago. Too hot in the sun to even lie in the hammock, let alone do any work. Last week was grey and miserable, with high temperatures in the 40's, and a dump of the dreaded "wintry mix" precipitation. We've had sub-freezing temps overnight ever since, and this week is sunny but cold. Sigh. Where'd my spring go? I'm trying to make the best of it and have been quite productive lately. I got a lot of outside work done during that warm week, while the sun shone. Now there are many seedlings to attend to indoors. And I spend a little time outside during the warmest parts of each sunny day. Otherwise I've been keeping my hands busy inside while I bide my time, however resentful of the vanished warm weather. Here's a rundown of the projects I've been working on lately. 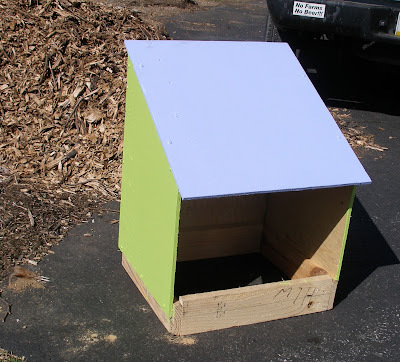 I painted the nesting box we made all from scrap wood. Bright colors of course, because if the wood needs protection from the elements, I might as well use colors that make me happy. Now that we're more or less set up for the broody hen, I'm eager for her arrival. Still no firm date for that yet. 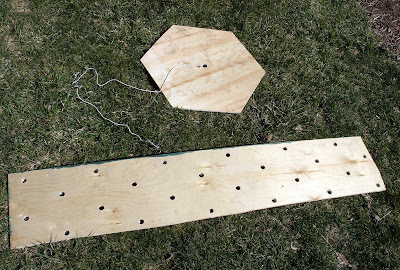 I finished two new two planting templates - a cool looking hexagonal one for the three sisters planting, and another one for the garlic planting on 6" centers. I've been using an 8" planting template for the garlic, but after getting carried away with some 350 garlic plants last fall, I've rethought my spacing for this crop. I also worked on finishing a few projects started with the help of our WWOOF volunteers. The first is a greens feeder for the chickens. 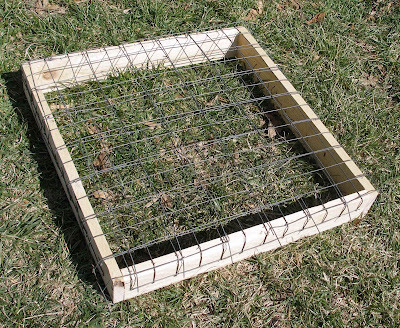 The idea here is that you plant greens the chickens like to eat under the feeder. The plants then grow up through the caging and the girls can eat what pokes up. But they can't tear the roots out of the soil, so the plants in theory should re-grow and continue to feed them for a long time. Since we move the hens daily throughout most of the year, I plan to use this in the yet-to-be-constructed hoop house which will house the girls next winter. In the meantime though I'm also hoping it will shield some tiny catnip seedlings from the ravages of cats - both ours and the neighborhood ne'erdowell toms. The caging for this project was repurposed from a tomato cage that will be replaced with a trellising system this year. 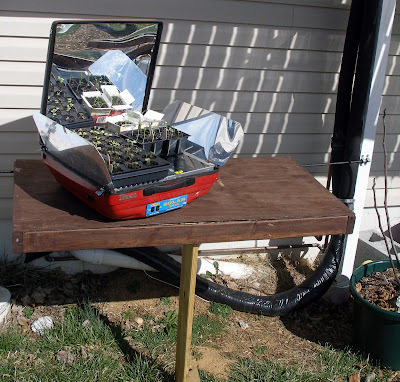 The second is my solar cooking station. This still needs a bit more work, but it's good enough to supercharge our seedlings with tons of sunlight at the moment. It mounts to the scaffolding for our solar heating array. A piece of rebar supports a wooden countertop from the back, and a wooden upright supports it in front. It's reasonably easy for me to set it up or remove it by myself. I'm hoping that the solar array doesn't completely shade it out in summer. I'll watch this, and if need be, lower the station a bit to get it out from under the shade. All of these projects - templates, nesting box, greens feeder and solar cooking station - were made with salvaged lumber and other free materials. Only the paint, screws, nails and some other hardware were, in some cases, purchased. 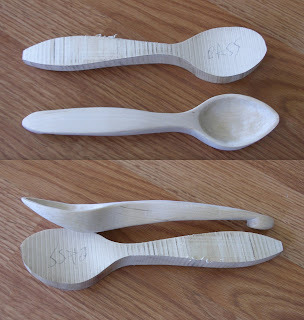 I carved a wooden spoon (from a spoon "blank") using the awesome woodcarving tools that my husband received recently as a gift. It's a rather addictive occupation, despite being tough on novice hands, and definitely one best pursued when the weather is fair enough to allow all the shavings to fall outside. Last year we broke our last two wooden spoons, so it's nice to be able to make some for ourselves. This one isn't very large, but it could be used with smaller cooking pots. I put a nubbin on the back of the handle end so it won't just slip into the soup if I set it against the rim of the pot. 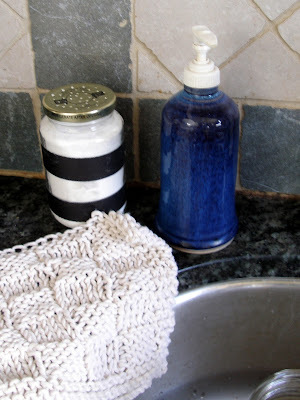 Based on a good tip from The Urban Homestead , I made a baking soda shaker from a glass jar with a metal lid. This is for dish washing, as baking soda is a mild and non-toxic abrasive. Just take a nail and make lots of holes in the lid, then fill with ordinary baking soda. The gaffer's tape bands around the jar were my own tweak. They're there to provide a better grip to wet hands. Also, a couple of knitted dishrags. 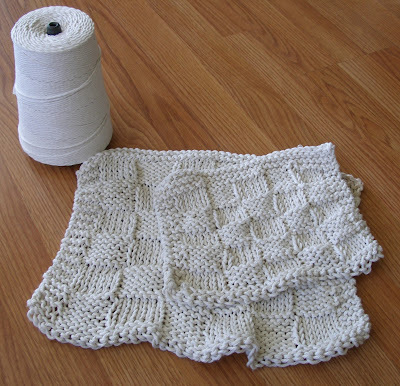 These are made from cotton butcher's twine and based on a pattern for a baby blanket I made many years ago. Look for large spools of this stuff in a restaurant supply store. It's much cheaper than buying the small rolls of a thinner gauge kitchen twine in a supermarket. I recommend you get a couple of spools. Keep one someplace clean for kitchen uses, and the other one with your garden tools. You'll find a thousand uses for it outside, but it's not easy to keep the twine clean if you take it to the garden. These dishrags can be made fairly quickly on days when you're cooped up inside. They don't wear out as quickly as scrubby sponges, and if you throw them in with the laundry they won't abrade your clothes. Also, they're thin enough to sterilize just with sun exposure. Google for a thousand pattern options. And I'm sure there are crochet patterns as well if that's your fiber art. I may experiment with dying these later as I have a dying project in mind and these could just be added into the soak. 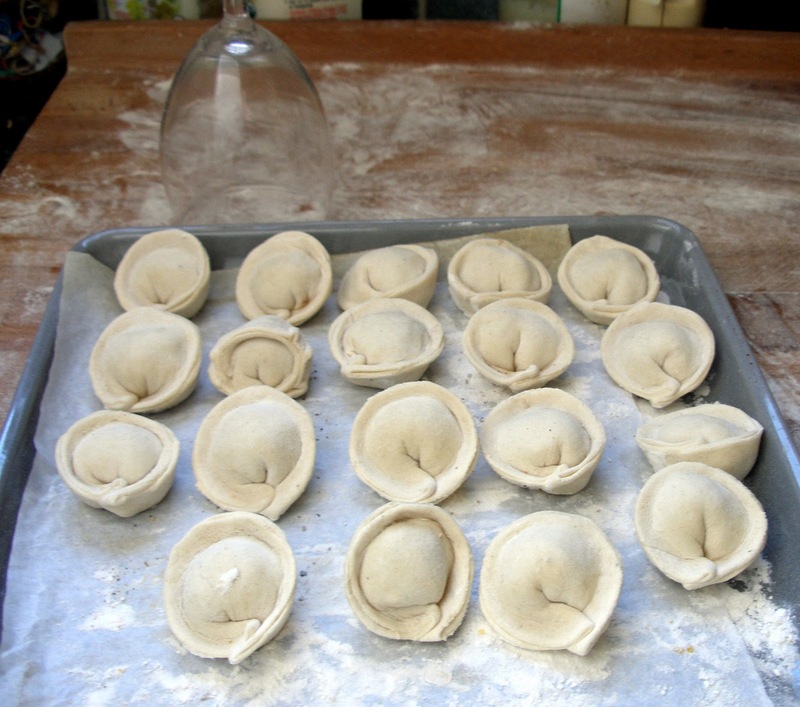 Pelmenyi. 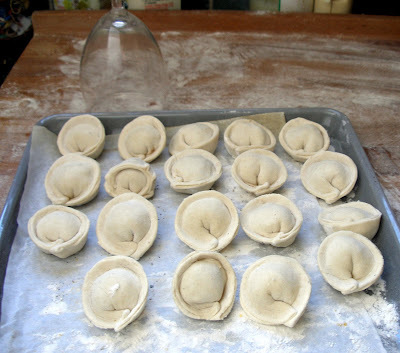 These are meat dumplings from central Russia. I've been meaning to make them for ages now. Some unpasteurized whey graciously donated by Sandy, defrosting my freezer, and unfriendly outdoor temps, were the impeti to finally undertake the project. And they are a project, believe me. It would be much more fun and go so much faster to have another set of hands to help with assembly. But I'm on my own this week. My recipe uses the whey plus one of our eggs in the dough, and three kinds of ground meat (pork, veal, and lamb - discovered while defrosting the freezer, and all local and pastured, of course) plus onion and spices in the filling. Traditionally these are kept in huge sacks on balconies over the many months of the Russian winter where there's no danger of thawing or spoilage. They are boiled and then served either with vinegar, or with the super high fat content smetana, to which our closest equivalent is sour cream, though it contains only roughly half the fat of smetana. Green onions are sometimes added as a garnish with either topping. Unfortunately, while working on the greens feeder I manage to bash my thumb with the hammer. I've never been unlucky or clumsy enough to do this before, and I can assure you that it's an experience I neither recommend nor care to repeat. It didn't seem like that hard of a bash, but 'tis enough, 'twill serve. 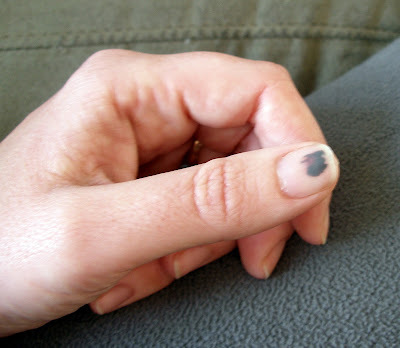 It hurt like the dickens, and still requires a lot of caution when doing everyday tasks. I'm really hoping that I don't lose the nail, 'cause that would seriously screw up the fast approaching heavy spring workload. It's very satisfying to see a few things made with my own hands that will endure and be useful for many years, mostly with very little expense. My head is full of little homesteading projects I want to undertake this year. Last year about this time I had the sense that things were finally starting to come together on the homestead. And indeed, things did run better last year; more things turned out the way I hoped. I have that sense this year too. It's a good feeling, though hard won. If my productivity holds up (and I freely admit that it's extremely fickle), it could be a great year for progress on the homestead. We'll see. I will probably do a post on the three sisters' template around planting time. If you simply must have more details on any of the other projects, leave me a comment and it may inspire me to get into the nitty-gritty. I've mentioned before how I love leeks. That's me brandishing a few prized specimens in the top left of the banner collage. Leeks take up real estate in the garden for a long time, but they are very unfussy plants, and they have the virtue of harvest-ability at that part of the year when it's very slim pickin's in the garden. 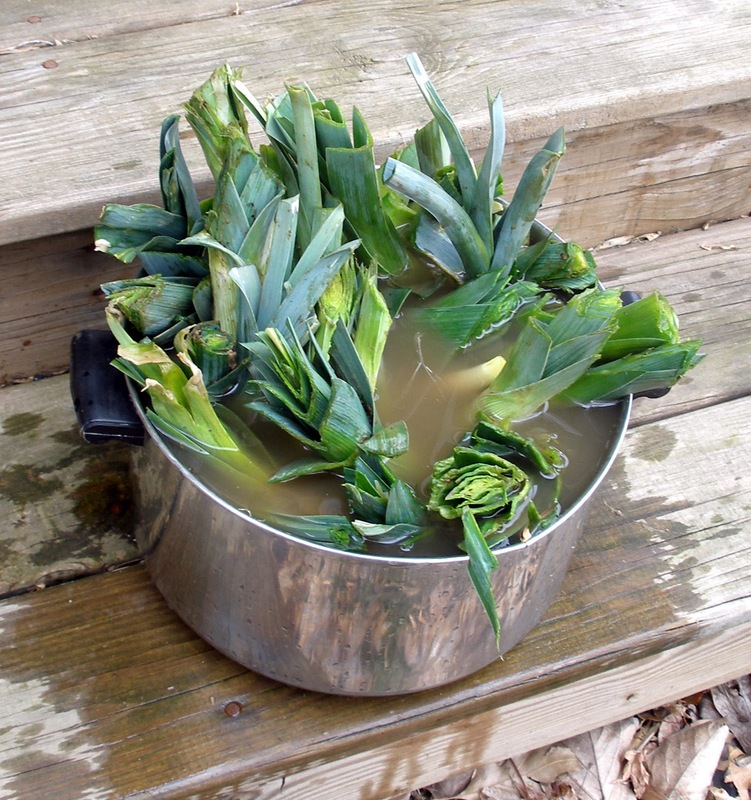 I've also just recently figured out how to store leeks for a short time by freezing them. But the bottom line is they just taste wonderful. So I'm starting an awful lot of them from seed this year, and I thought I'd share a little technique I've come up with. It starts with the knowledge of how leeks behave. That part of the leek which is below the surface of the soil will grow straight and white, and be the tenderest part of the leek. Perhaps the sweetest part too. In other words, you want to bury the seedling as deeply as feasible without completely covering it. Leeks and potatoes are the only plants I know of that respond well to hilling. But it's not really practical for me to plant leeks in a trench and then gradually fill it in over the season. That technique works beautifully, if you want to pursue it. I'd just rather not plant leeks in a single line and then tend to them that much. Instead, I'm working on forcing my tiny seedlings to grow tall before I set them out. At this stage, they are fairly easy to "hill." 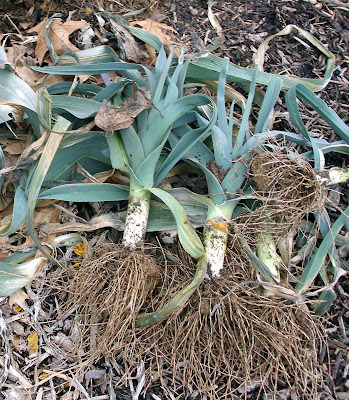 Besides, leek seedlings are so floppy as they grow that they can use the support of repeated partial burials. Some sources advise clipping the tops of the leek seedlings to avoid this flopping over, but that seems counterproductive to me. I'd rather support the seedling than trim it. My idea was to save several half-gallon milk cartons for seed starting. Leek sprouts are so tiny that they can easily be crowded into a very small space. So I use the carton in its upright position, with the top cut off and several drainage holes poked in the bottom. I also cut most of the way down the corners of the carton, so that only a small portion of the carton will hold potting soil at first, and fold the sides down to allow plenty of light to reach the seedlings. The waxy surface of the carton interior can be labeled in crayon or with a wax lumber pencil. 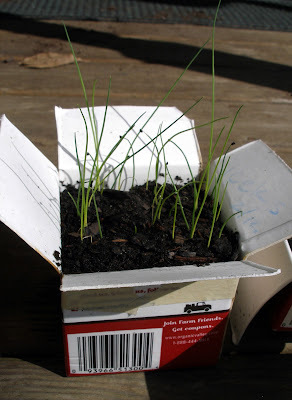 As the seedlings grow I progressively tape up a bit more of the sides of the carton, add more potting soil, and make another crease to keep the unfilled portion folded over to give the seedlings light. Adding more soil to densely planted and flimsy plants is somewhat delicate work, so I use a spoon and dry potting soil that scatters easily. If the potting soil bends any of the little seedlings as I fill, I just very gently pull them upright and the loose soil repositions itself around the stalks. Only then do I water with a mister. In this way I'm both supporting the seedlings, and encouraging them to grow long and tall well before it's time to put them in the ground. When the sides of the carton are completely taped up and filled with potting soil, the seedlings will be more than 4" (10 cm) tall. I'm betting that by the time it's warm enough to transplant them they'll be long enough to just plant quite deeply and leave it at that with no further hilling. I think the technique is sneaky. It's a way of shifting most of the work needed to raise superior leeks into the relatively calm period before spring has properly arrived. The picture above shows leek seedlings and their milk carton containers in several stages of development. Just planted seeds are on the right; those on the far left are the oldest. P.S. The homesteading books from the giveaway were mailed on Monday. Winners, you should have them in your hot little hands very shortly if they haven't reached you already. Thanks to all who entered. Update: this technique didn't work out as hoped. Today is absolutely gorgeous. Gorgeous. The temperature outside is as warm as inside - in the middle of March. The sun is shining, and the breeze is so gentle. This weather is insane, but you know what? I'll take it. I puttered around outside most of the morning, just finding stuff to do rather than spend time indoors. I pulled the covers entirely off the cold frames, planted some burdock, smoked the bacon I'm in the process of curing, admired the purple crocuses, watched the cats chase flies, set the hammock up, and generally basked in the finest day of the year so far. A pile of grapevine trimmings has been hanging around since my husband did a severe pruning a few weeks ago. I'd been meaning to check them out, but what decent weather we've had lately has been devoted to more pressing chores. But today - ah, today. Any excuse to be outside would do today. So I made these. Now I know they aren't exactly works of a master craftsman. But I was pretty pleased with them. For an hour's mucking around on a balmy day, a few snips here and there with hand pruners, and not a clue as to how to go about making a wreath, I'd say they turned out fair enough. Maybe it's just that I get a kick out of making something from nothing, out of finding a use where other people only see garbage or something to be gotten rid of. It tickles me every single time I manage to pull something like this off. 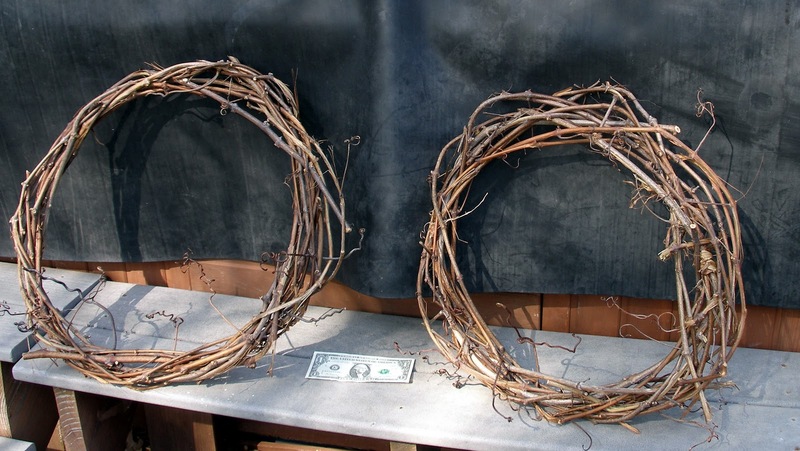 If I'd had more grapevines, or longer grapevines, I could have made more wreaths or bulked these two out a bit. Many pruned vines were too short to be useful. The vines were clearly starting to dry out a bit; if I'd worked with them a few weeks ago I think they would have been more flexible. Still, the vines and especially the curlicue tendrils were surprisingly resilient. Given my total ignorance of the proper way to construct a grapevine wreath, it was a very forgiving medium to work with. Next year I'll encourage my husband to make the cut pieces as long as possible, and then see what can be done with them when they're freshly cut. Not sure what I'll do with these yet. The nice thing is that if I decide I don't have any use for them, they can either be gifted away, or composted! Okay, now I'm heading back outside. P.S. to those who entered the homesteading books giveaway, I haven't heard back from one winner. So stay tuned. If I don't hear from her by tomorrow evening, I'll draw another number. You still might win! And if you entered but didn't check to see if you won, well check it out. Last year I didn't start my own seeds of my favorite leek, the Bleu de Solaize. It's my favorite because it is incredibly winter hardy. I've left it in the ground over winter in previous years, and harvested it during a January thaw, when the air temperature warms but the ground is still frozen. Sometimes those midwinter harvests involve pitchforking out a frozen block of soil, letting it sit in the sun for several hours, then coming back to extract the leeks. But I couldn't get Bleu de Solaize starts last year, so I went with whatever leek starts were available at my local nursery. I don't even remember the variety. So when late fall started turning into winter, and many leeks were too small to be worth harvesting, I didn't have a whole lot of hope for them. I harvested up until the ground froze, starting with the biggest ones first. The rest were left to winter's untender mercies. But as winter began to loosen its grip on the garden, I cast another evaluating glance over the bedraggled leeks. Some of them certainly were looking large enough to salvage. And with volunteer help around, it seemed like a good food preservation chore to tackle. Besides, that part of the garden is has a date with 25 crowns of purple asparagus in not too many weeks. My expectations were rather modest. 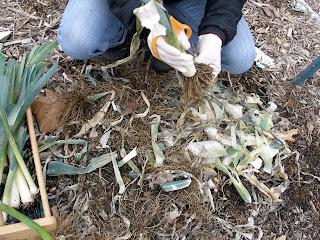 Our volunteer and I loosened the soil with a pitchfork and set about "field dressing" the leeks. We shook off as much of the soil as easily came loose, cut off the roots, stripped off the dirty and damaged outermost layers, and trimmed away most of the greens. There were more beautifully preserved leeks, and larger amounts of leek below the soil surface than I had imagined. There was surprising little damage from frost, even though we found bits of ice held in the layers of the upper green parts of the plants. Leeks are tough plants. I was amazed to find that the harvest just about filled my garden hod. 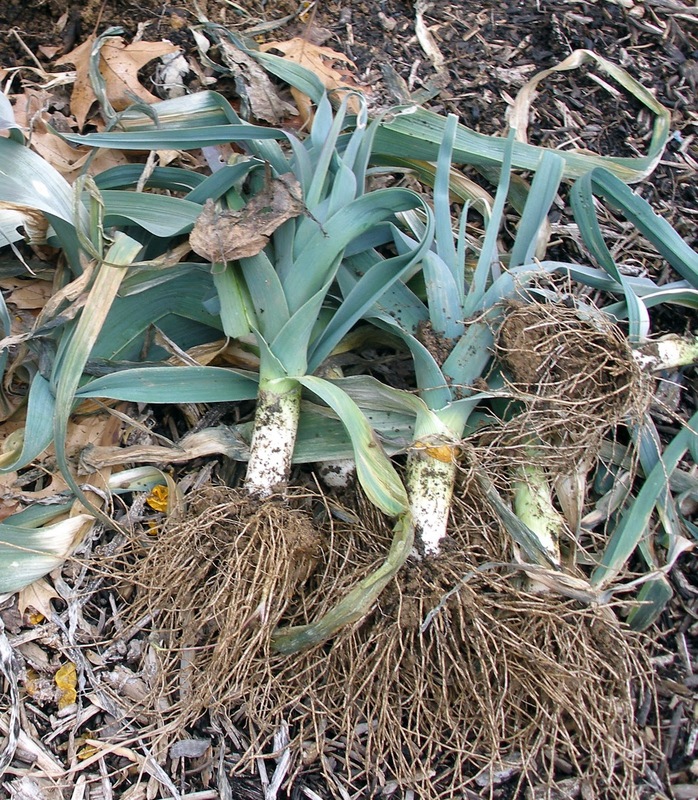 It seems that Bleu de Solaize isn't the only leek that overwinters for us with zero protection. The harvest tally came to over five (!) pounds (2.3 kg) of trimmed leeks. Only a small number were too damaged to harvest. It was very satisfying to remove so much food from the row, and have it all cleaned up well ahead of the asparagus crowns' arrival. 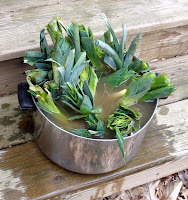 We rinsed the leeks in two changes of water outside, to spare the plumbing in our old farmhouse. Leeks have many virtues, but their hygiene leaves much to be desired. Because of the way they grow up through the soil, they catch a prodigious amount of dirt in their layers. That people are known to put up with the trouble of cleaning such a plant should tell you something about the wonders it can do in the kitchen, though not perhaps the detail that these wonders are particularly on display where soups and potatoes are concerned. After the outdoor work was done, there was still a good deal of indoor processing left to do. Trimming, assiduous rinsing, chopping, butter melting, cooking and cooling. The end result was a dozen discrete piles of sauteed leeks arranged on sheet pans lined with baking parchment. Once the individual clumps of leeks were frozen solid, I bagged them up. 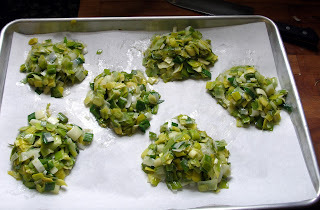 This way I can grab a usefully sized portion of partially cooked leeks out of the freezer whenever needed, rather than having to thaw a huge block of them all at once. Preserving this many leeks was another task which would have been tedious in the extreme to do all by myself. Having volunteer help made the work lighter, and I had the pleasure of teaching someone about a previously unfamiliar vegetable. Another win with the WWOOF. I've already got quite a few Bleu de Solaize baby leek sprouts started indoors. And I can't seem to resist planting more of them. I'm hoping we'll have enough to harvest starting in late summer, and still leave plenty for harvest well into this time next year. It's time to announce the winners of the homesteading books giveaway, and I do so with just a smidgen of trepidation. The delivery date for my books keeps getting pushed back, and I don't have the books in hand as I write this. Tracking reveals that my package moved from Kentucky to three different cities in Pennsylvania, two of which could obviously have been the point where it was put on a delivery truck. Then it went to New Jersey. Now it's back in my neighborhood, but in the city where it first seemed to go amiss before. There's no telling where it will go from there. This is all to say, that I'd like to promise to get the books in the mail and sent to the winners right away, but I'm waiting to see what the routing gizmos decide to do with that package. It was great to hear from so many small-scale homesteaders and aspiring homesteaders. It struck me that an unusual number of you included blueberries among your productive plants. I can certainly see the appeal. We've got seven blueberry plants ourselves, and we hope to see our first harvest this year. 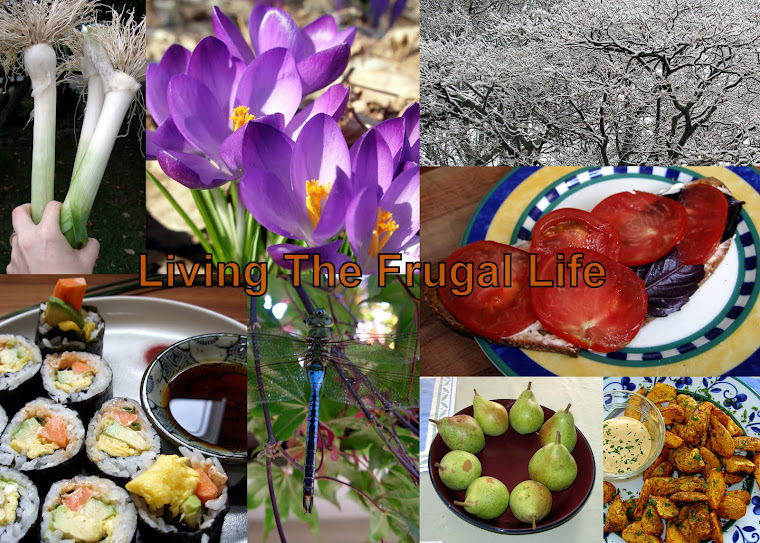 Copy #2 of The Urban Homestead goes to Dea-Chan,who blogs at Craziness and More! The Backyard Homestead goes to Cindy Naas Stapleton near Minneapolis. 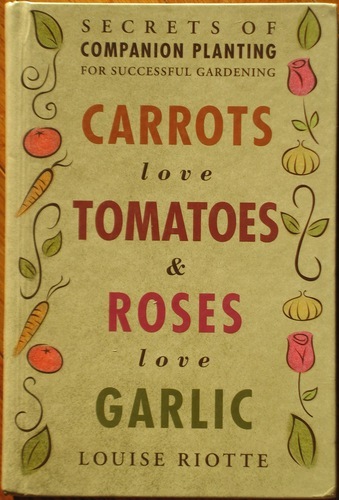 I hope that all three books will lead to more food production in backyards. Go forth, winners, and feed yourselves! But first, please leave your full names and mailing addresses in the comments by Friday, March 18th. Comments will be moderated for the time being, and your information will not be published. If I don't hear from any particular winner by this Friday, I'll generate another random number and try again. Confidential to the element near Mpls who entered the drawing, and all the rest of you who are still reading, I would have loved for your number to come up, just so my curiosity could have been satisfied. Addressing a package to Polonium would have been pretty nifty. Or perhaps your name is Niobe Copperfield? That your identity will remain an enduring mystery is not an unappealing thought. I can't tell you what a great thing it is to know a few local farmers on first-name basis. I get all kinds of benefits from my acquaintance with them, and being a paying customer for the foods they produce is just the tip of the iceberg. Last year my farming friend offered up a disabled turkey poult, and we had the experience of raising it for our table. She also sends pork jowls my way for free because her customers don't want them. So I get to turn them into guanciale. This time we'll get a broody hen with some heritage breed fertile eggs under her. The idea is that we'll foster her and give her a place to rear her chicks. After that we might split the chicks with the farmer providing the hen. I've toyed with the idea of raising chicks before, but could never motivate myself to place an order and then buy necessary equipment to set up a brooder for them. Being a surrogate chicken mother has just never appealed. The alternative - a broody hen with good mothering instincts sounded fantastic. Such a hen is all the equipment needed to rear chicks. But my laying hens are production model Red Stars with no mothering instinct, and besides, I have no interest in keeping a rooster. I'm pretty sure my neighbors have their limits in my residential setting. So the out-of-the-blue offer of a broody hen was another fantastic opportunity just dropped into my lap through the magic of personal acquaintance with farmers. After last year's turkey+honey bees infraction, I'm trying to stick to my one new species per year rule this year. The Black Soldier Fly is going to be this year's unglamorous species of choice. But a broody hen with chicks is all sorts of excitement without rule breaking. Chickens we know. Chickens we've done. The brooding-hatching-rearing process is entirely new to us, but it still falls within my self-imposed and sanity-preserving limitation. So I'm psyched! Our homestead will be host to a new phase of animal husbandry. At least I hope. I'm bearing in mind that old adage about counting chickens. I'm especially eager to see this process through because in the back of my mind I've thought about using a bantam hen to brood quail eggs and rear the young, should I ever decide to try my hand at quail. (Domesticated quail aren't known for their mothering skills.) Working with a broody hen ahead of time seems like the smart move. Details are still a bit unclear as to the timing and other issues. Sometime around the middle of the month we should take delivery of a broody girl and "her" eggs. They may not all be hers biologically, but I'm pretty sure she'll feel rather proprietary about them. I don't know whether the farmer will want the hen back with the chicks, or whether he'll want us to keep her. Details should be forthcoming eventually; farmers are busy people. In the meantime, a small DIY project is on the agenda. I'm guessing she and her chicks will do best with a separate space from our layers. At the very least she'll need her own nesting box for her fertile eggs. I figure she and her chicks can use the poultry schooner while the other hens are kept in the mobile pen and coop. I find myself wild with the hope that the brooding experiment works out. I am uncharacteristically excited about all the potential cuteness of tiny chicks. It's a good thing that they go through an ugly phase as they grow and molt for the first time. I'm not sure yet whether we'll keep any of the female hatchlings. We definitely won't keep any males, though if the farmer doesn't want them either we could always turn them into meat and chicken stock. As for our current layers, if you were waiting for details on their conversion to canned meat and chicken stock due to the egg-eating habit, they've been given a stay of execution. Securing a small number of layers this time of year isn't proving easy, and I don't want to get rid of the ones we've got before I know we can replace them. The egg-eating has also eased up a bit lately, though I'm not at all convinced the problem is solved. I'm keeping them for at least a couple more weeks as I try to figure out where the next layers will come from. Success! It took a few politely persistent email requests, but I've now got the long coveted recipe for the lacto-fermented ketchup I sampled at 2010's PASA conference. The recipe comes from Maureen who blogs at Nourishing Traditional Cook. I know more than one reader has asked for this, and I very much wanted it myself. I'm posting the recipe now so that anyone who wants to try it out with canned tomatoes can do so. Perhaps some of you Aussie readers have fresh tomatoes still to play around with. I'll probably wait until our own tomatoes come in and then smoke a few to mimic the fire-roasted flavor of the Muir Glen tomatoes called for in this recipe. Puree in blender or VitaMix. Let sit on counter for 12-24 hours, refrigerate. You may also substitute balsamic vinegar for the whey. It won't be as much fermented, but is truly delicious! By the way, I can attest to the high quality of the canned tomatoes called for in this recipe. They're what I relied on before we became self-sufficient in tomatoes. I don't know how many vegetarians or vegans are going to be put off by this recipe. All I can say is that this ketchup rocked my world. I'd eat this stuff on eggs, beans, or as a side dish to just about anything. It was that delicious. I will definitely be playing around with this recipe this summer, and may post an update on any successful tweaks that I find especially pleasing. I'm curious to see whether I can incorporate a bit of onion without overwhelming the other flavors. My fumbling experimentation with lacto-fermented ketchup last year definitely taught me that any addition of onion should be tiny in comparison to the rest of the ingredients. If any of you experiment with the recipe - either using canned tomatoes or homegrown - I would really love to hear back from you about any tweaks you make, or just what you think of the recipe. Please let me know! NOTE: If you entered the drawing for the homesteading books with an anonymous sign in and no identifying details (first name + city, or email address in the body of the comment), I can't verify your identity if you win. If this applies to you, leave another comment with some details to be sure you get a chance at the books. Anonymous entries with no details will be discarded. It's great to hear about so many small scale homesteads from all of you. Keep up the good work! 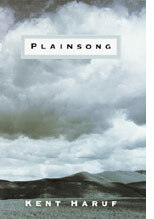 In honor of a certain overreaching family in southern California, I'm giving away three homesteading titles this week. I've ordered three copies of Kelly Coyne and Erik Knutzen's book, The Urban Homestead. They're now shipped and on their way to me. One is my copy, and two are up for grabs. Also, I'm giving away my own, gently used copy of The Backyard Homestead. Here's your chance to win one of these great titles. To enter the drawing for one of these books, leave a comment on this post briefly describing your homestead - either as it exists right now, or what you hope to achieve in the future. Comments must be received by 6pm Eastern time, on Friday, March 11th, if you want a chance at winning one of these books. Sorry, but this is open to US residents only. **If you're not signed in with an identifiable account, leave enough identifying information so that I can verify the prize goes to the right person. (e.g. Clare in Boston, or something similar. )** If you're only interested in one or the other of these titles, please indicate that in your comment so I can be sure they go to readers who will use these books. If the random number generator picks someone not interested in a given book, I'll generate another number. I'll announce the winners by Monday, March 14th at the latest. Good luck! While our first WWOOF volunteers of the year were here, one of our indoor tasks was to process what remained of last year's garlic crop. Preserving what remained involved peeling all those individual cloves, cutting them open to remove the sprouts (which are slightly bitter), slicing them finely, and dehydrating all the slices. It's a rather mindless, tedious job - one that would have taken me all day in the kitchen if I'd had to do it entirely by myself. Two extra people pitching in made the work go very quickly, and I was extremely grateful for the help. Our volunteers genuinely seemed not to mind, and to be interested in the process of dehydrating foods. We did better with last year's crop of garlic than with any previous harvest in terms of storage. Some of it lasted until this month, though much of it was sprouty. In late December of 2008 I was already processing that year's crop because it was at the end of its shelf life. Mostly I think the improvement in shelf life is attributable to storing it in the cooler temperatures of the root cellar. 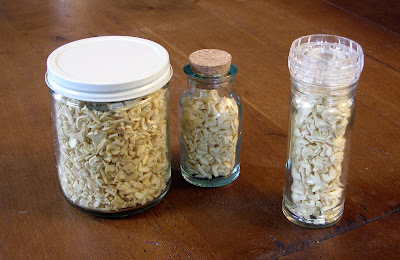 One tiny tip that I don't think I've shared here before is a way of repurposing what might otherwise end up as part of the waste stream into a convenient way of using up the dehydrated garlic chips. Some spice companies are now selling whole peppercorns (including black and white organic peppercorns) in disposable jars that are also pepper mills. These can be re-used as grinders for any spice of the right size, including dried garlic chips. When all the pepper has been consumed, the lids of these mills can be screwed off and both the jar and the grinder-cap washed. When both pieces are thoroughly dry, I fill the jar with my dried garlic flakes and keep it with my other pepper mills. The rest of the chips will be stored in a cool and dark place until needed. I rely on this dehydrated garlic much more heavily during the garlic drought months of the year - those months between processing the last of the garlic (now), and garlic harvest (early summer). I use it in soups, pasta dishes, and have even been known to grind some directly onto a leftover roast chicken sandwich. An especially nice winter use for the ground garlic is in a cup of hot chicken broth with a small dab of white miso stirred in. Bone-warming goodness, that is. The whole chips work well in some soups and stews too, as well as meatloaf, in which it rehydrates by absorbing and holding in the juices, and long cooking dishes such as polenta or risotto. I sent our WWOOF volunteers on their way with our old, cheap dehydrator and many explanations as to its design faults and shortcomings. I suggested they bear with the crummy version for a season or two, to see if they would actually use a dehydrator. If so, they could bite the bullet and purchase a good quality dehydrator, such as an Excalibur . I asked them that either way - whether they upgraded to a good dehydrator, or decided it wasn't for them - they pass the dehydrator on to someone curious about this method of food preservation. It's a nice thought to imagine our first el cheapo dehydrator out there in the world, helping people learn a skill and preserve homegrown food. I vastly prefer giving a not-so-great appliance away with full disclosure and a pay-it-forward agreement to trying to sell it to someone while concealing its many flaws. Now I've got a very short breather before our next WWOOF volunteer shows up tomorrow. Good to have the extra help; it certainly keeps me on my toes!